What an amazing week. 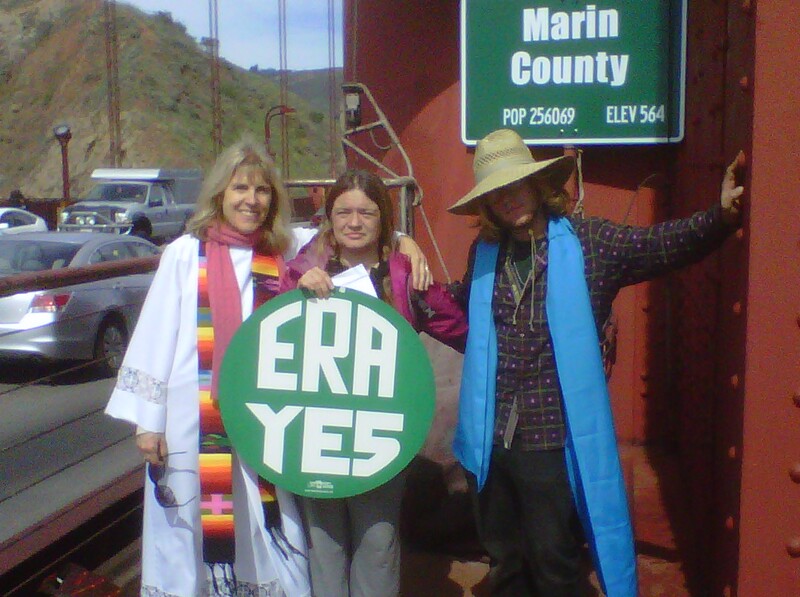 We launched my pilgrimage across the USA for the ERA on March 8, 2014. The skies were clear, boats were on the bay, it was a beautiful day. 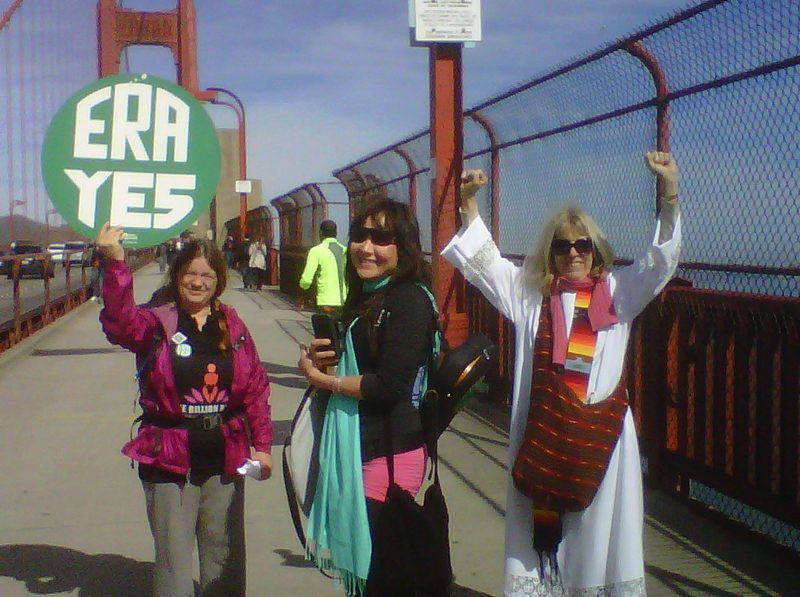 We had nearly a hundred people for International Women’s Day Bridge Walk: Let’s Pass the ERA! Folks started arriving in small groups. Before we knew it we had a rather good size. The group moved to the flagpole and a number of different groups spoke before the crowd. Then it was our turn, MonaLisa Wallace, Board Member of the National Organization of Women came to the mic, she spoke of the need for the ERA and Somer Loen, also of NOW who introduced me, followed C.E.D.A.W. MonaLisa. It was at this point that I turned over the mic to Rev. Este for my blessing. I felt such calm and peace. God was reassuring me that I would be okay. Then Rev. Este invited the crowd to participate. People gathered laying their hands on me and laying their hands upon each other. It was truly a blessed sight. Este, Harry, Kathryn, Mona and me walked across the bridge together where we went our separate ways to share the news and bask in the glory of the day. I caught up with Harry and Dunphy Park where our ministry Olof’s Brothers, an agape service, which serves the anchorage was going strong. I spoke with many of our congregants. Harry who has assumed my late husband’s position of running the program arrived shortly thereafter. We enjoyed laying on the grass and the sun dancing on our skin. We enjoyed the world God created for us. 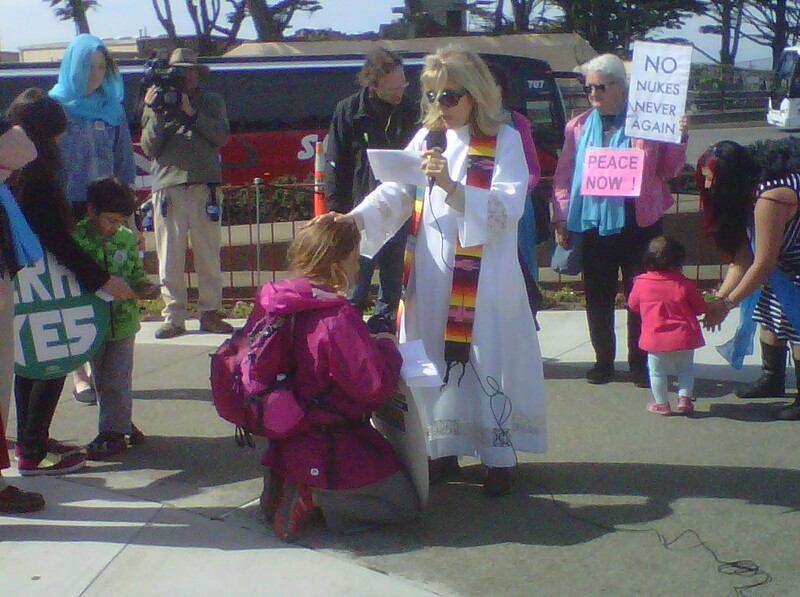 We then headed up to Christ Church Sausalito the first parish to host me on my pilgrimage. Father Chip Larrimore let Harry and I into the parish hall where I helped myself to the chocolate chip cookie stash unaware it had been set aside for Sunday Coffee hour. I hope everyone forgives me. I was unaware of my transgressions at the time. The next few days were made very easy for me as Harry arranged for a place for me to stay each night. We said our “so longs” at the Indian Valley Campus Organic Farm where Harry is part of their work/study program. We prayed to God that he protect on both and look after our ministries. I then made my way to Vallejo. I slept roadside on Highway 37. It was a time for solitude. It was the 50th anniversary of my late husband birth. It felt good to be alone with my thought of him and God. 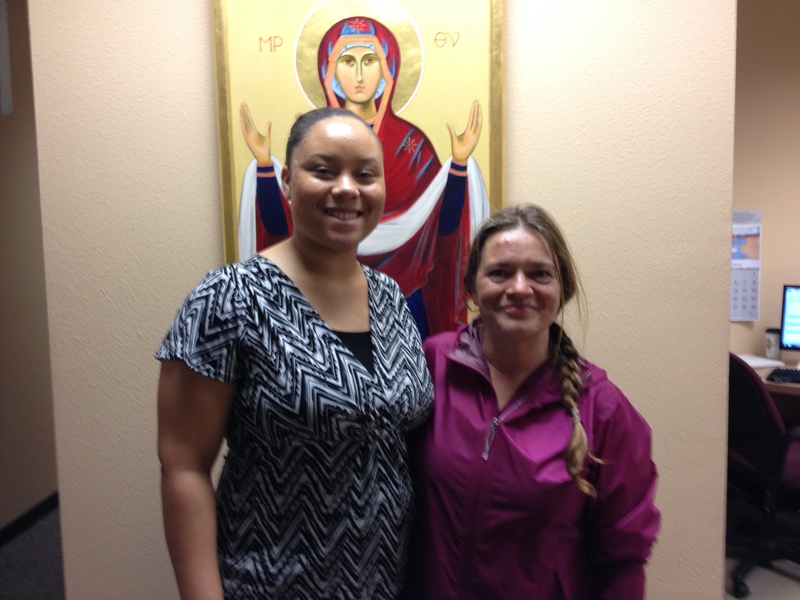 When I arrived in Vallejo, Ann Arms of Ascension Episcopal Church in a beautiful home with pristine views of Mt. 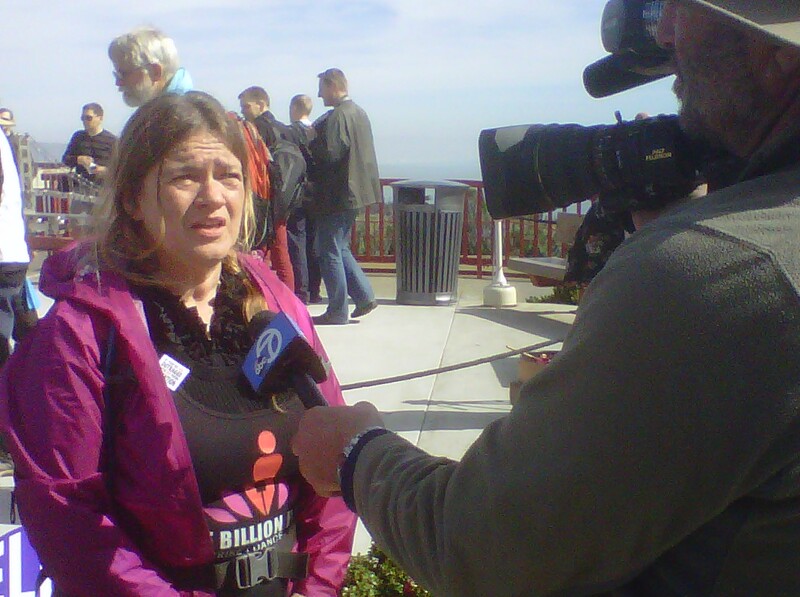 Tamalpais and the San Francisco Bay hosted me. Ann a widow like myself discussed just how hard it is being alone making our way and the difficulties of being an older woman in this society. She washed my clothes. They were quite dirty. It had been several days since I had had a shower, so she set out toiletries and I felt brand new as the water hit my skin. The next morning I was interviewed by Sarah Rohrs of the Herald Times and I met with Mel Orpilla of Congressman Mike Thompson’s office. I learnt that Congressman Mike was a big supported of Women’s Rights and that they would forward the news that I was headed to DC to their Washington offices and that Mike would be speaking with his colleagues in congress about my pilgrimage and would work colleagues to ensure passage of ERA resolutions moving the House. The meeting ended and it was time for me to move north towards Carson City, NV, my first state capitol on the short list of those states, which have yet to ratify the ERA. I wound my way on back roads to Vacaville, California where Carlyn Chrystal invited me to shower at her home. I enjoyed a meal at Church of the Epiphany, which they sponsor for the homeless and economically disadvantaged of the area. It was humbling to see the good works of this community. I spent the night in the parish hall. Waking early to head off to Davis, California. Upon arrival in Davis I reached out to Father Mark Allen of the Episcopal Church of St. Martin’s who on short notice made arrangements for me to take a shower and stay at the parish hall. I attended all three services and was deeply moved by his sermon. He helped make clear the difference between Faith and Belief. I walked away knowing that I have faith that I will a make it to Washington DC. 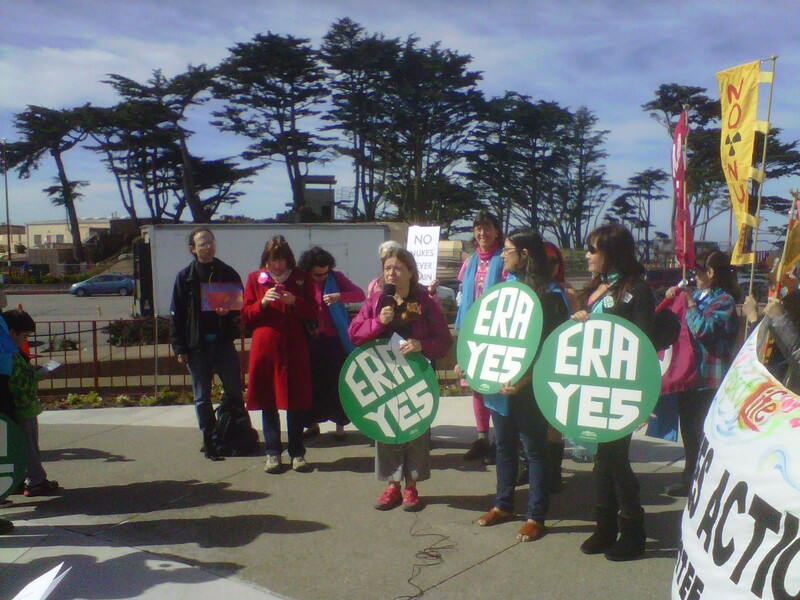 I believe we will pass the ERA by 2015 with everyone working together. I am now in Sacramento where after a visit with Thea (the Bishop’s Assistant) of the Diocese of Northern California, I spent the night with my late husband’s childhood friend Steven Plesser, a criminal defense lawyer who is active in defending the rights of many activists in the area. I learnt a little more about my husband and how he a young child even then was championing the rights of others. I felt William’s presence. It was a precious evening. This morning I awoke thankful for this life that God has given me. I prayed for the strength to continue on my pilgrimage. I have faith that I will cross the Nevada desert and that God will provide the means for me to do so. I believe that with all of us working together we can pass the ERA. With all of us working together “We Can Pass the ERA”! 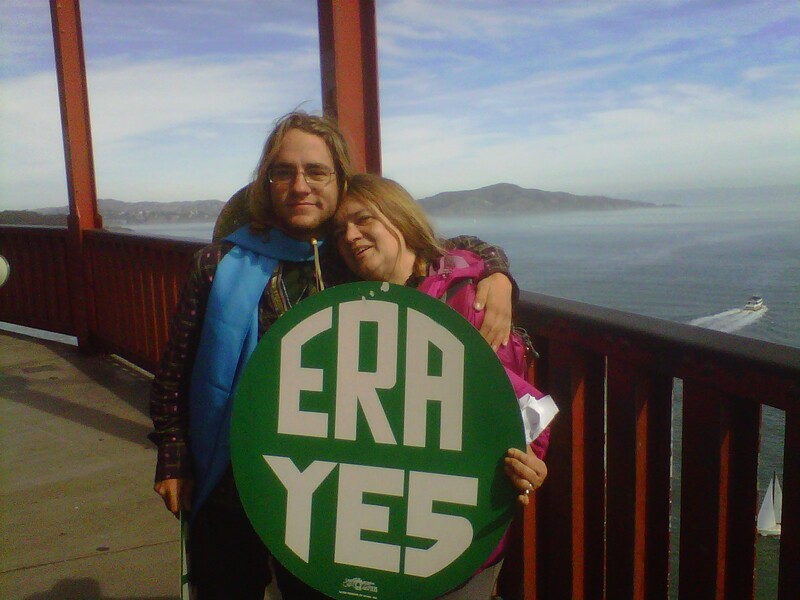 Wanting readers to learn more about the Pilgrimage for the Equal Rights Amendment. Please join us as we support Helene Swanson’s Pilgrimage.